The remote country of Papua New Guinea, popularly known as PNG, will provide the quintessential paradise Island holiday. The country stretches across half of the mountainous island of New Guinea, which it shares with Indonesia, incorporating jungle lowlands and dozens of smaller islands. Papua New Guinea is a challenging travel destination due to its lack of transport infrastructure. However, the difficulty of exploring the territory has meant that the country has remained one of the most mysterious and culturally authentic in the world, making it irresistible to adventurous travellers. Hundreds of different cultures are evident in this small amount of land. Due to the drastic isolation some mountain communities have only recently discovered neighbouring tribes, despite living in close proximity for thousands of years. Even Port Moresby, PNG's capital and largest city, has no major roads connecting it to other towns. Inaccessibility has allowed tribal culture to thrive undisturbed by the modern world. Papua New Guinea is home to more than 800 languages and a multitude of diverse customs and cultures. The best region to experience tribal culture in Papua New Guinea is in the Highlands, but these mountainous areas can only be explored on foot, remaining inaccessible to all but the most intrepid of visitors. With almost no connecting paved roads, air travel is mandatory for getting around the country, even though there are also only a handful of paved runways. Planes flying over the jungle were once worshiped by 'cargo cults' in Papua New Guinea, especially during World War II, when locals would watch mesmerised at new airport runways as 'spirits' descended from the heavens. The safety record of airlines in PNG is patchy and travellers wanting to avoid prematurely turning into spirits themselves should review recent airline safety information. It makes sense that the main attraction of the country for tourists is a hiking trail, the famous Kokoda Track, a 60-mile (96km) trek especially popular with Australian tourists. The region it covers saw intense fighting between Japanese and Australian forces during World War II, giving the trail historic relevance. It also traverses through beautiful, pristine jungle and allows travellers to experience some of the country's famous biodiversity. 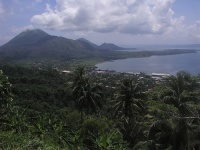 For those up for the challenge, July through August is the best time to visit Papua New Guinea for hiking. Surfers wanting to experience the uncrowded breaks of Papua New Guinea should visit the northern beaches between November and April, and the southern beaches between June and September.